You can make this tart in a round pan and cut into wedges for a lovely dessert, but try making this easy treat in a square pan when you need dainty squares to serve a crowd! Oven poaching the rhubarb ensures that the rhubarb retains its delicate pink hue. 1. For fruit, preheat oven to 350° F. Mix sugar, wine and vanilla and toss with rhubarb. Pour into a shallow baking dish and cover. Bake rhubarb for 30 to 40 minutes, until tender. Strain off syrup into a small saucepot, reserving rhubarb. Bring syrup up to a simmer. Whisk cornstarch with 2 Tbsp cold water and whisk into liquid, cooking until thickened. Remove from heat and pour over rhubarb. Chill completely. 2. For crust, combine graham cracker crumbs and sugar and stir in melted butter until an even crumbly texture. Press into a 9-inch square fluted tart pan and bake for 8 minutes. Allow to cool completely. 3. For mascarpone, beat both cheeses with electric beaters until smooth and blend in sugar, lemon zest and vanilla. While beating, add in whipping cream and mix until thickened, about 2 minutes. Spread filling into crust and top with rhubarb. Chill for at least 2 hours for slicing. 4. Yield: 1 9-inch square fluted tart pan. Makes 9 to 12 servings. 5. VARIATION: Rhubarb Cream Tart with Chocolate Crust. Use a 31/2 x 13-inch rectangular tart pan. Substitute 2 cups chocolate cookie crumbs in the Crust. Substitute 1 dozen stalks of whole fresh rhubarb in the Fruit. 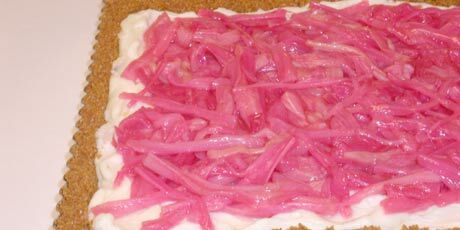 In Step #3, lay rhubarb lengthwise on top of tart. Yield: 6 to 8 servings.